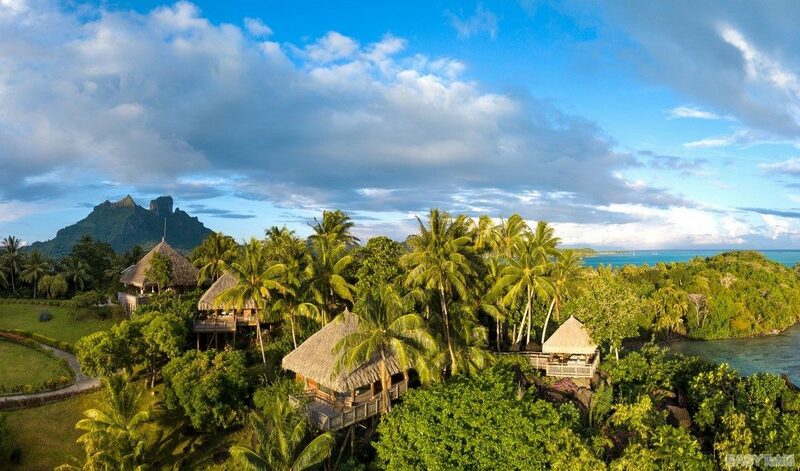 - The very privileged location of the hotel: located in a creek of "Motu To'opua". 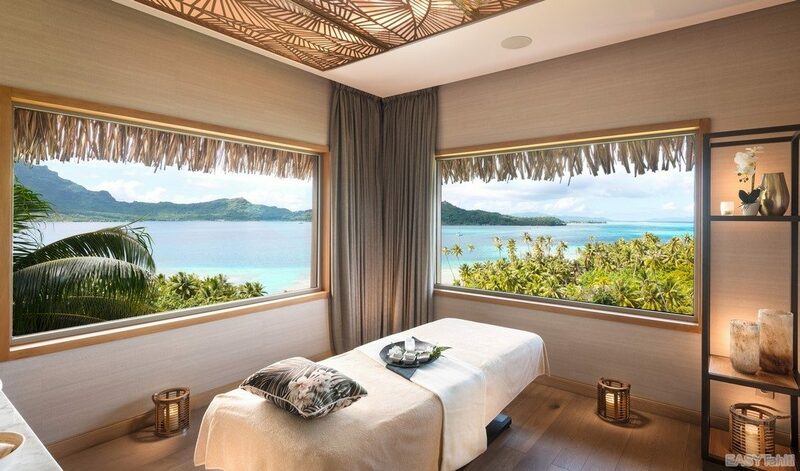 Tranquility and beautiful view of the "Mount Otemanu" from the Spa. 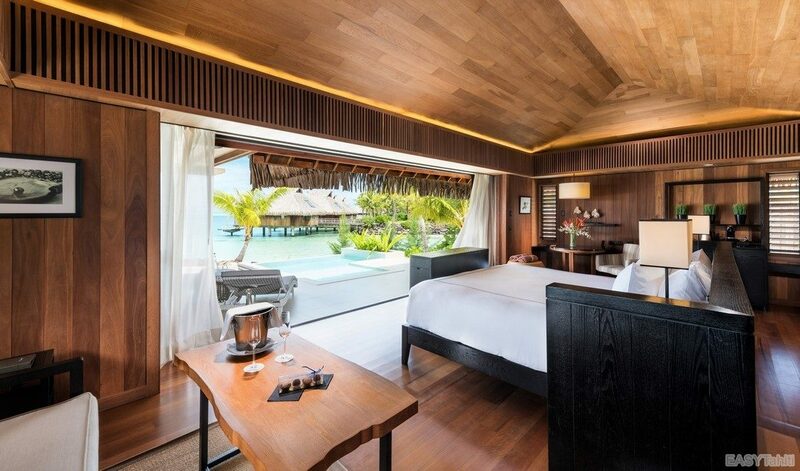 - The overwater bungalows are among the most spacious on the island, with a bonus, a huge terrace. 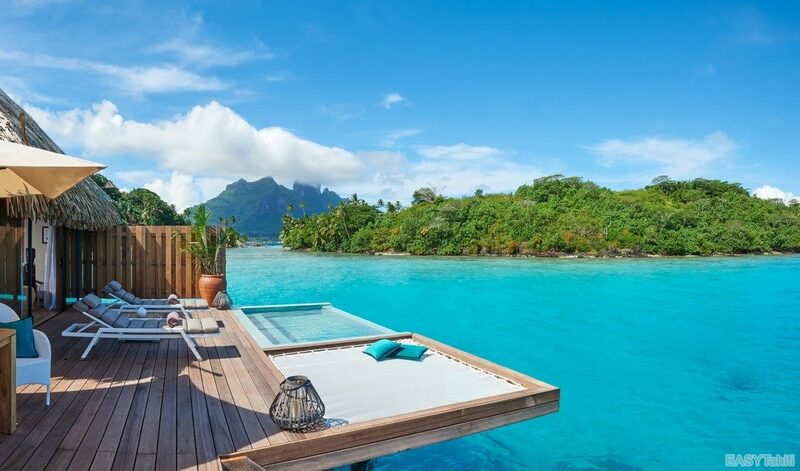 - The elevated Spa is the only one in Bora Bora to offer such a beautiful view of the lagoon and the islands of Taha'a and Raiatea. 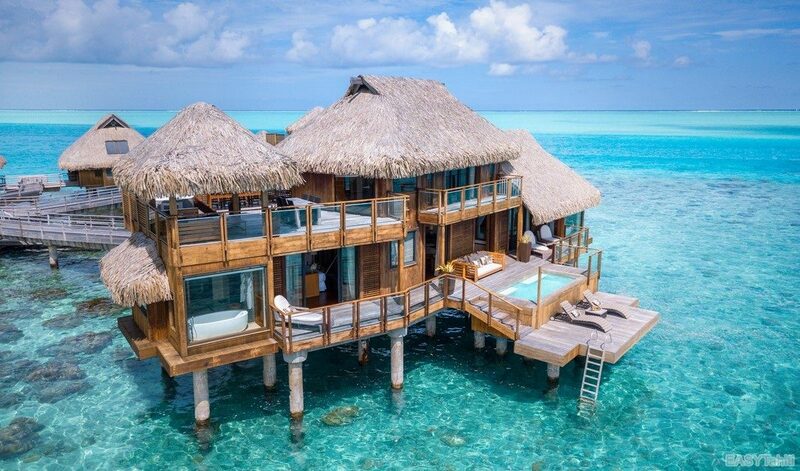 - All around the resort, the waters are deep enough to house beautiful coral potatoes and a multitude of tropical fish. 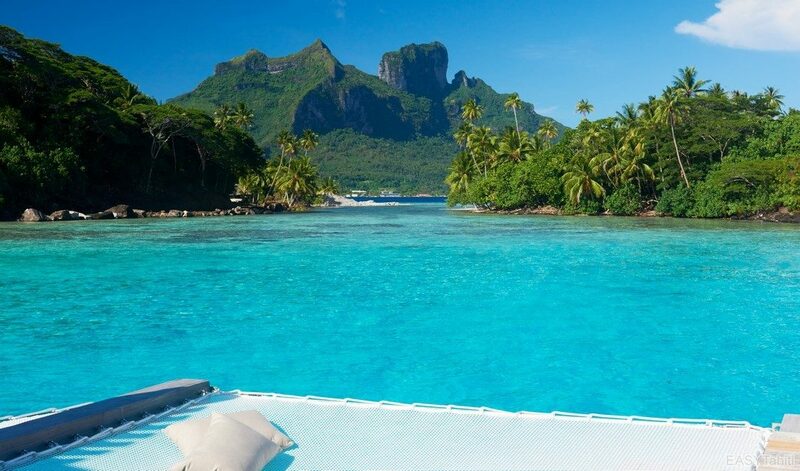 Excellent spot for snorkeling. 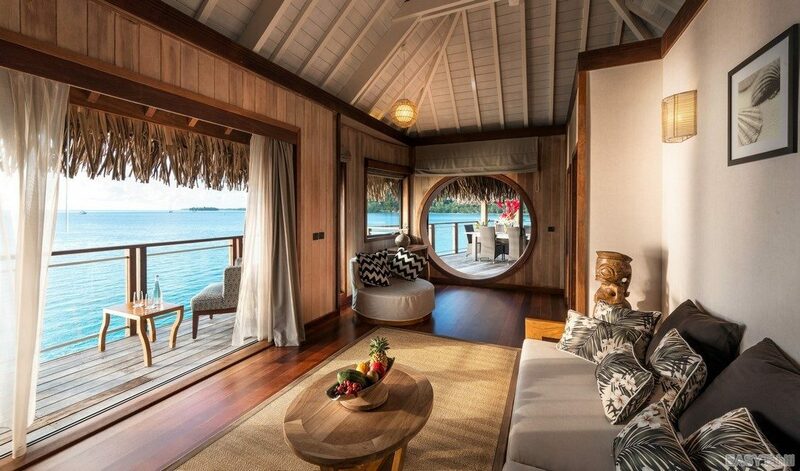 - All bungalows and villas offer views of Bora Bora lagoon and the horizon. 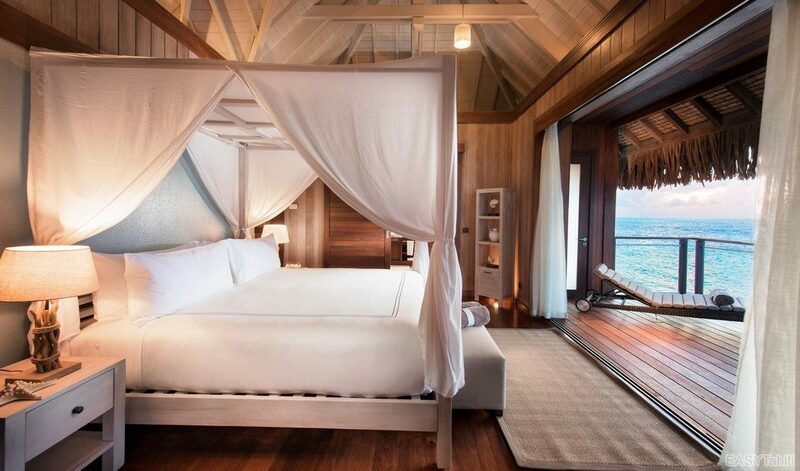 - The Resort is located on the longest white sand beach of Bora Bora (800m). 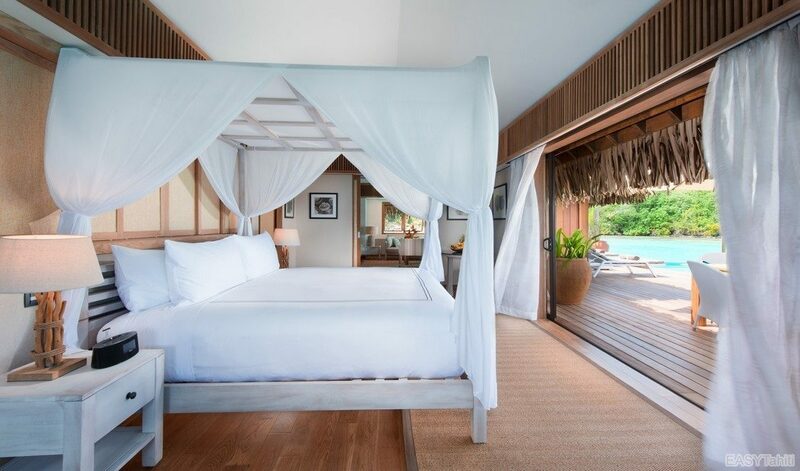 Location: On the Motu To'opua lagoon, on the South West of the main island, "Conrad Bora Bora Nui" is set in an 8-hectare park overlooking the bay, surrounded by lush vegetation. * To note: For your displacements, please consult the possibilities in the heading "Transfers" of this same file. 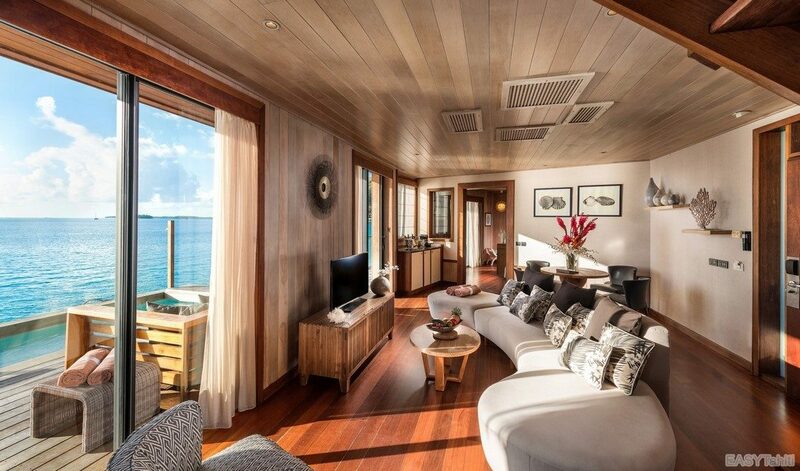 - 09 Suites Lagoon View - 101m² - 3 adults max or 2 adults and 2 children (- 13 years). - 10 Garden Villas - 101m² - 3 adults max or 2 adults and 2 children (- 13 years old). 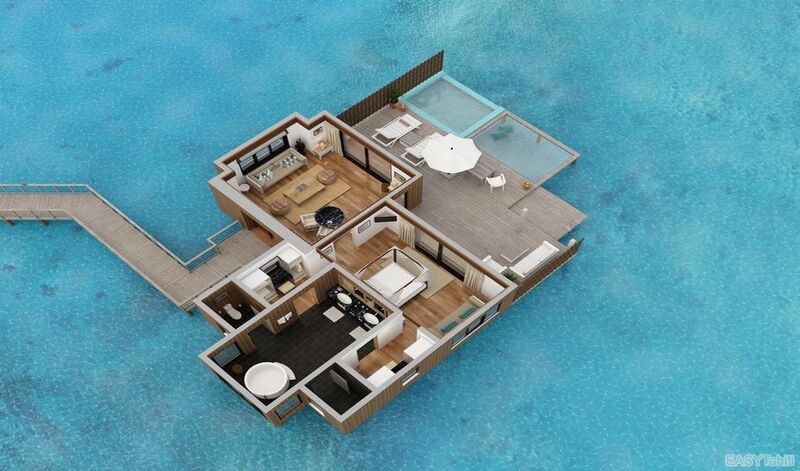 - 07 Horizon View Villas - 101m² - 3 adults max or 2 adults and 2 children (- 13 years old). 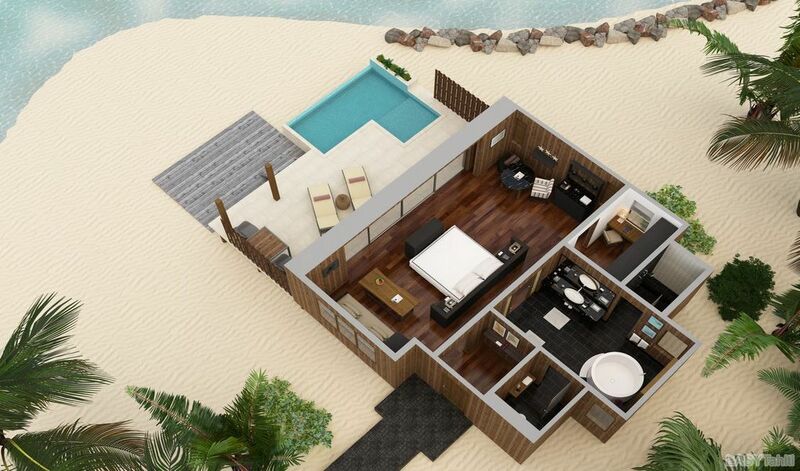 - 02 Beach Villas with Pool - 124m² - 3 adults max or 2 adults and 2 children (- 13 years old). 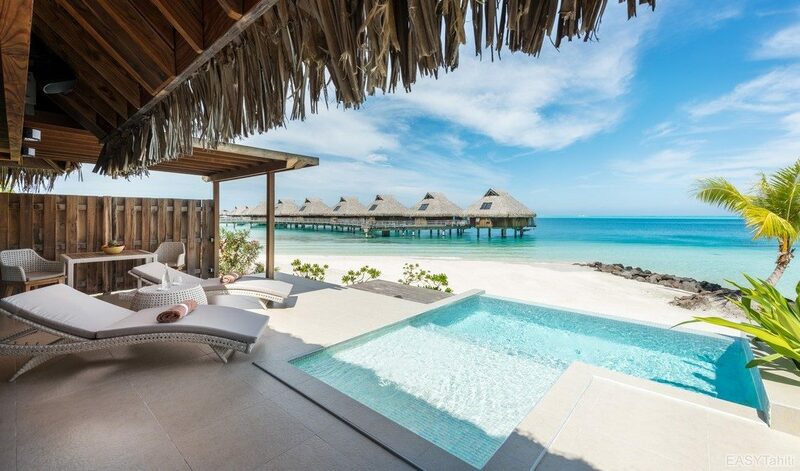 - 34 Overwater Villas - 116m² - 3 adults max or 2 adults and 2 children (- 13 years old). 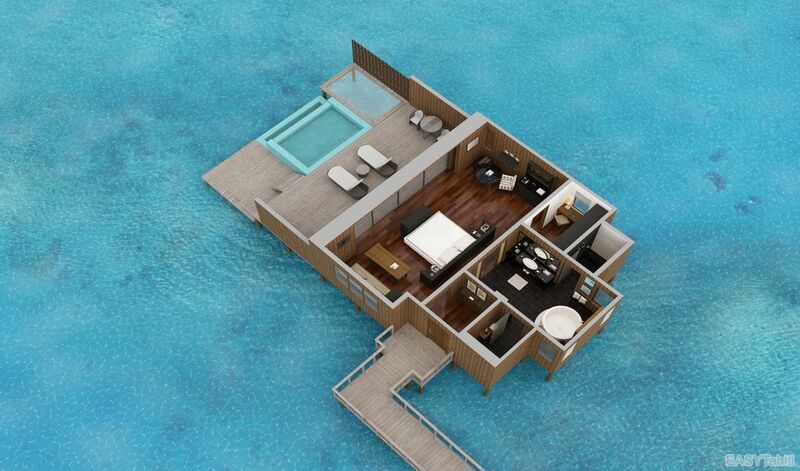 - 32 Deluxe Overwater Villas - 116m² - 3 adults max or 2 adults and 2 children (- 13 years old). 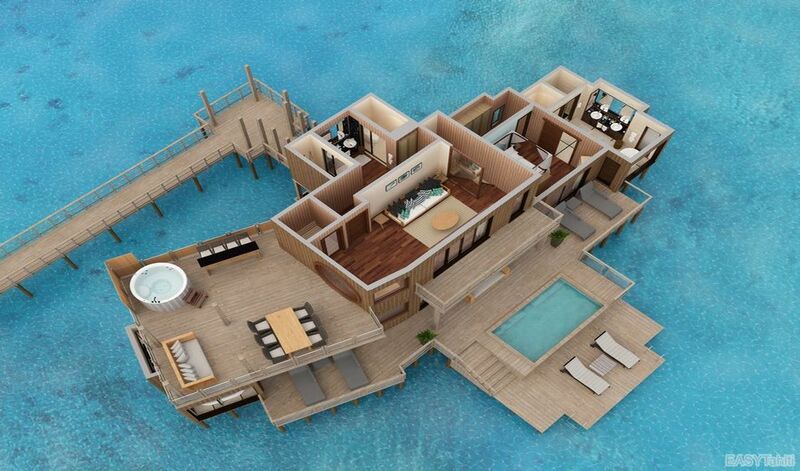 - 16 Overwater Villas with Pool - 121m² - 3 adults max or 2 adults and 2 children (- 13 years old). 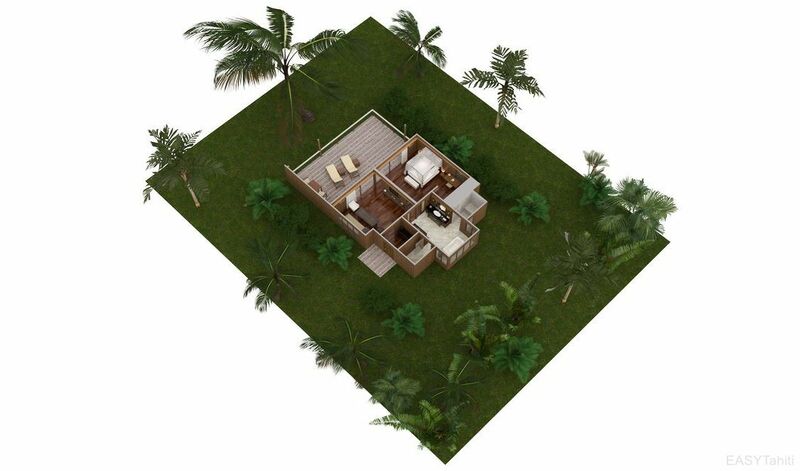 - 02 Royal Pool Villas with Pool - 151m² - 4 Adults max. 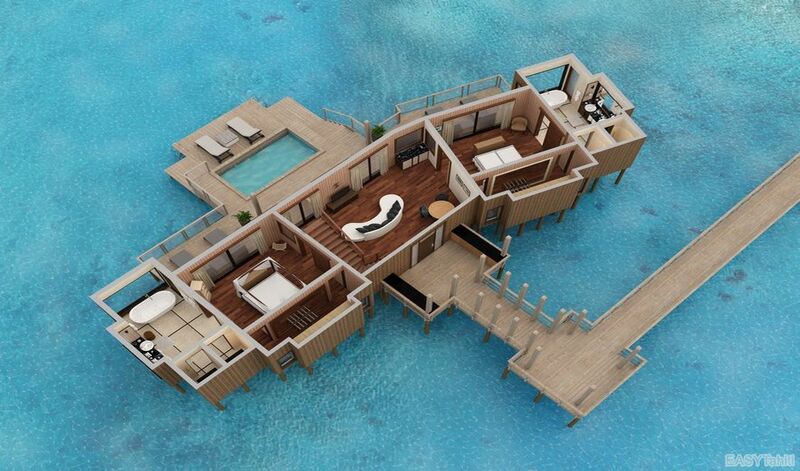 - 01 Presidential Villa on Stilts - 301m² - 6 Adults max. 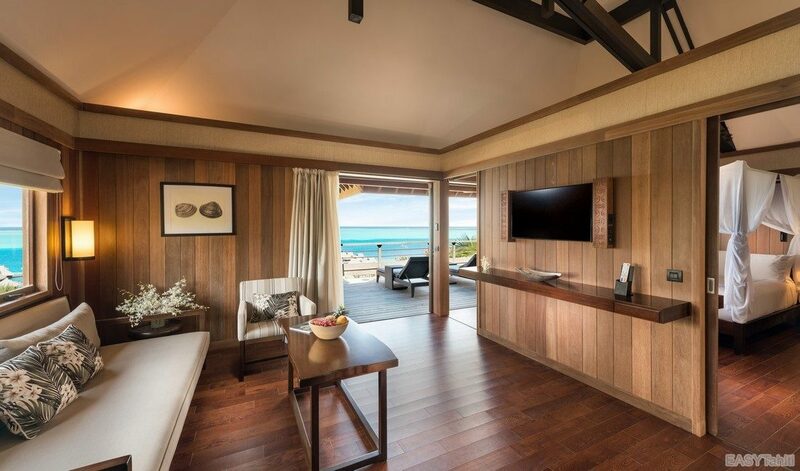 - Stay with family or friends: All villas can accommodate a minimum of 2 adults and two children (under 13 years) - The Royal and Presidential Villas have even greater capacity. The day kids can spend time at Tamari Kid's Club (a structure for 4/7 years and a second for 8/14 years). 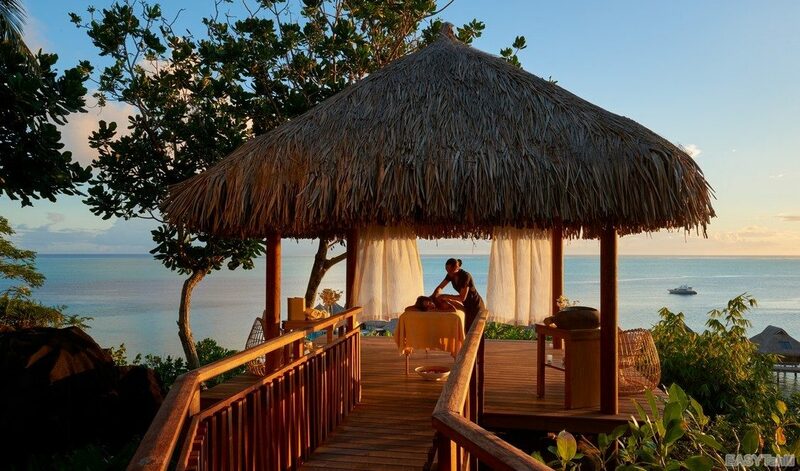 - The "Hina Spa" located on the hill, offering panoramic views of the lagoon. 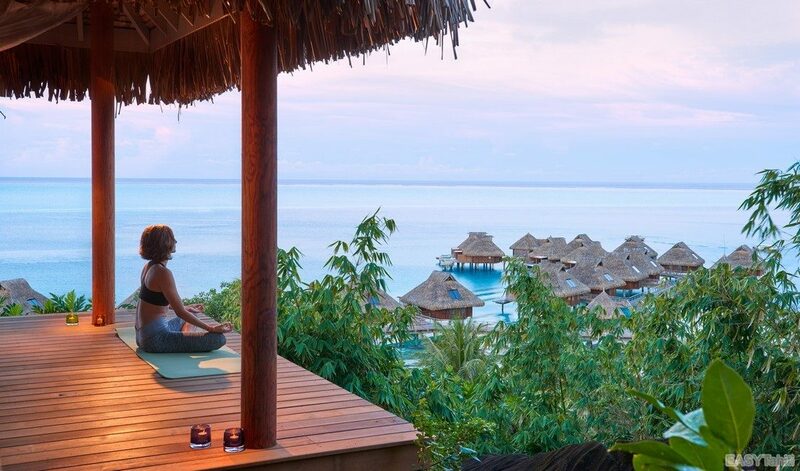 Full range of Polynesian and international treatments. 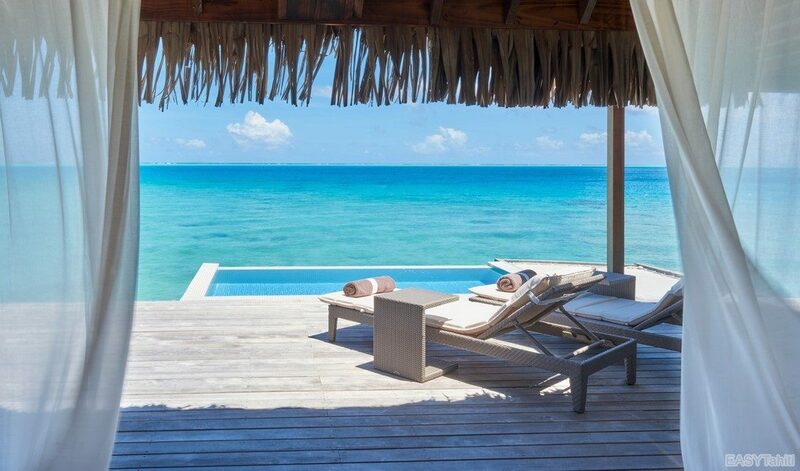 - Infinity pool of more than 1000m² with deckchairs and parasols. - Very large natural beach with white sand (800m long). 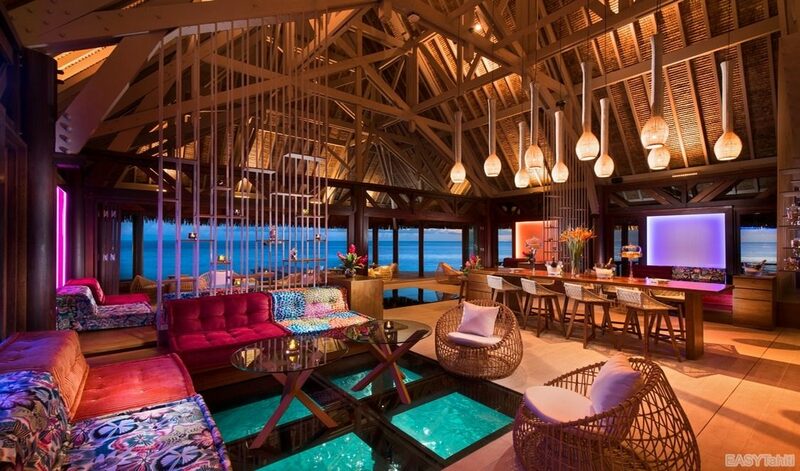 - Water activities center (snorkeling equipment, kayaks, canoes, stand-up paddle ...). 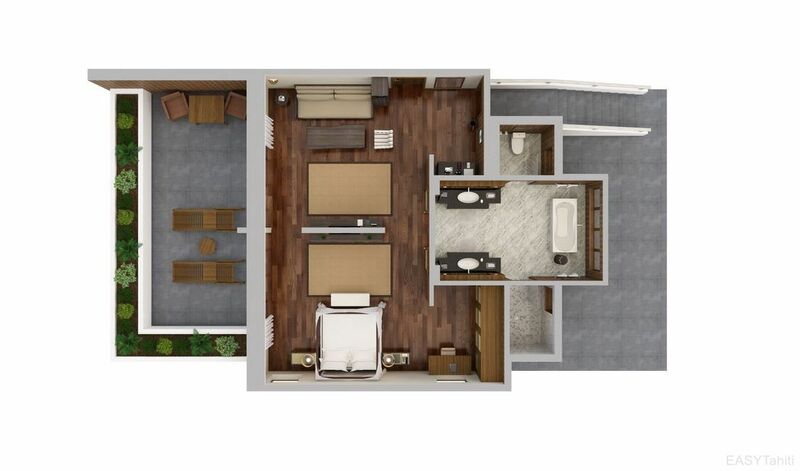 - Fitness room, Hammam, Sauna. - Shops (jewelry, clothes, souvenirs). 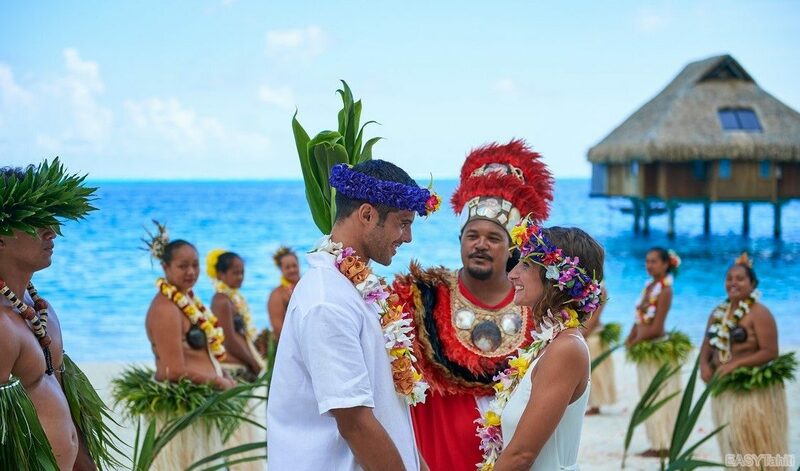 - The "Motu Tapu" for privileged romantic moments. - Reception open 24 hours. - Pick up your luggage on arrival / departure, and delivery to your room. 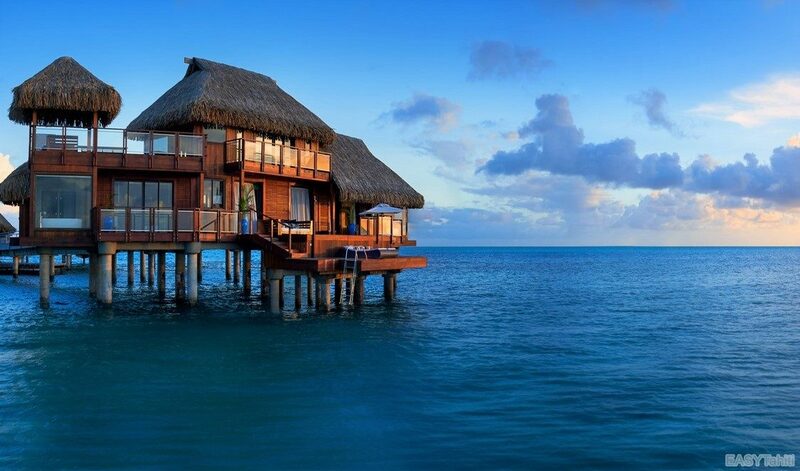 - Concierge service for your activities, excursions. 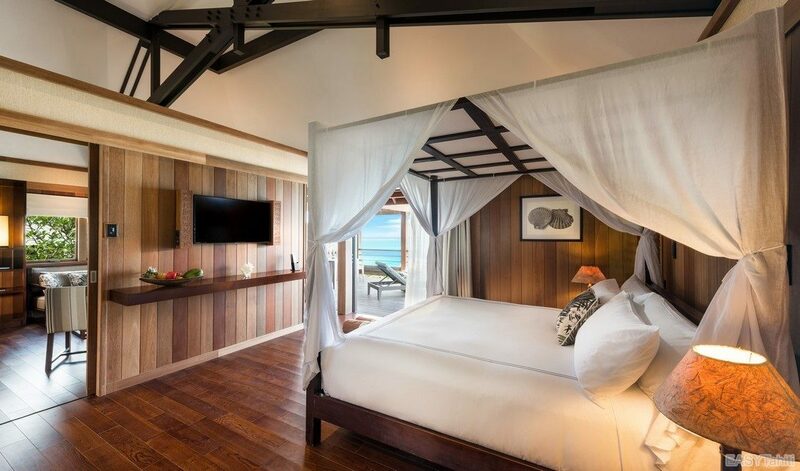 - If capacity permits, children under 13 years old are allowed at no extra cost in their parent's room / bungalow. - Everyone over 13 is considered an adult. - Cot extra baby on request at the time of booking. 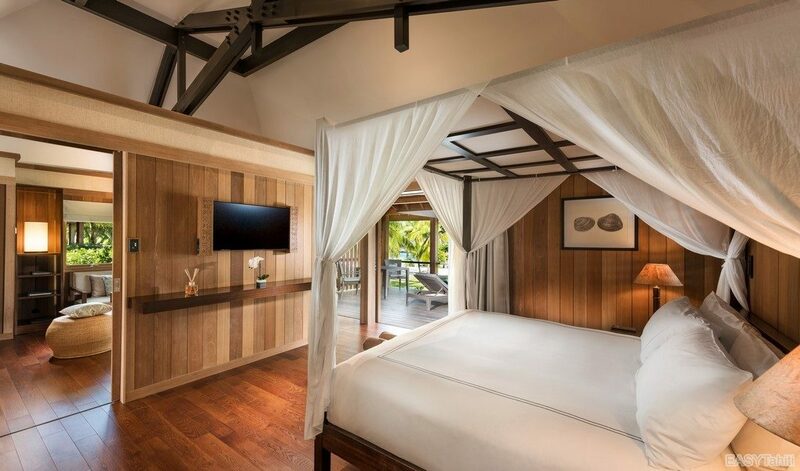 - A person under 18 must be accompanied by a person of full age to occupy a Villa or Suite. 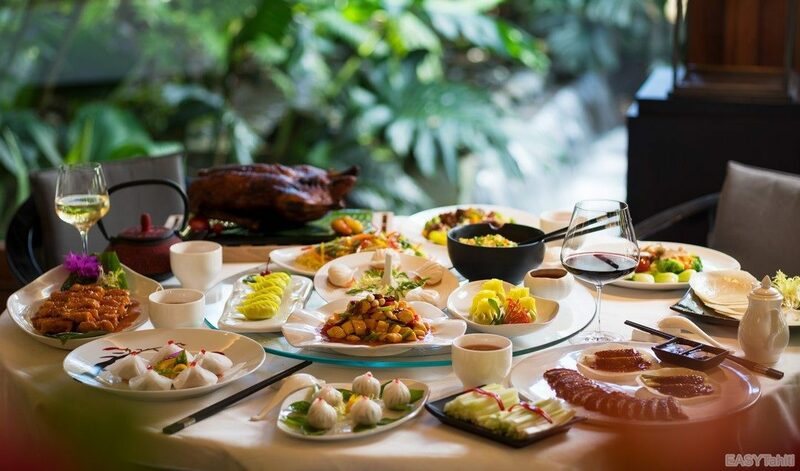 - Children from 0 to 6 years old can eat and drink for free under the children's menu (breakfasts, lunches, dinners), and enjoy a 50% discount on traditional restaurant menus, themed dinners and Christmas Eve and New Year's Eve. - Children from 7 to 12 years old receive a 50% discount on traditional dining menus, themed dinners and Christmas and New Year's Eve parties. - In the case of a group transfer (non-private), free for children under 12 years. Full price from 13 years old. 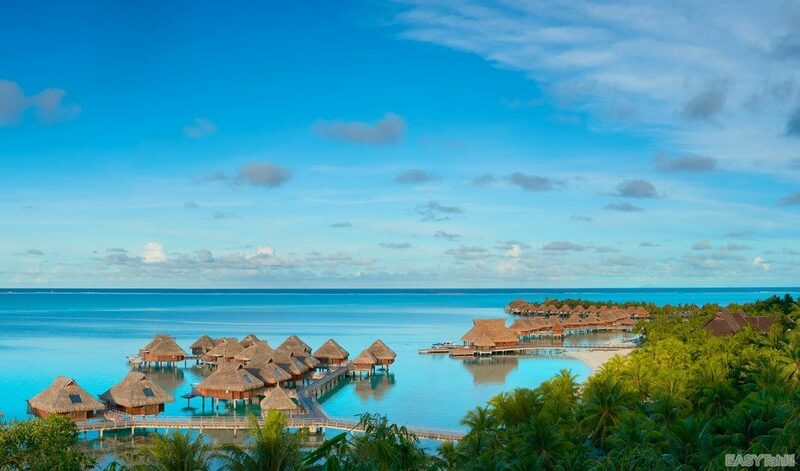 - In the case of a reservation for a private transfer, there will be no discount for children. - Local currency (Pacific Franc XPF). - Check in the local currency. - Credit cards (Visa, Master Cards, American Express, ...). - Currency exchange at the hotel. - French, English, Spanish, Japanese, Tahitian. If you wish to check in before 3:00pm, you can order an early check-in. If you wish to make your room after 12:00pm, you can order a late check-out. 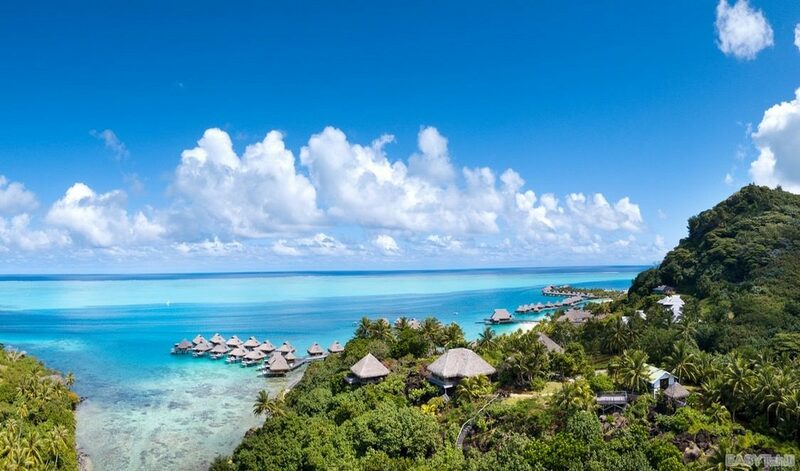 Please contact your EASYTahiti travel advisor for more information. 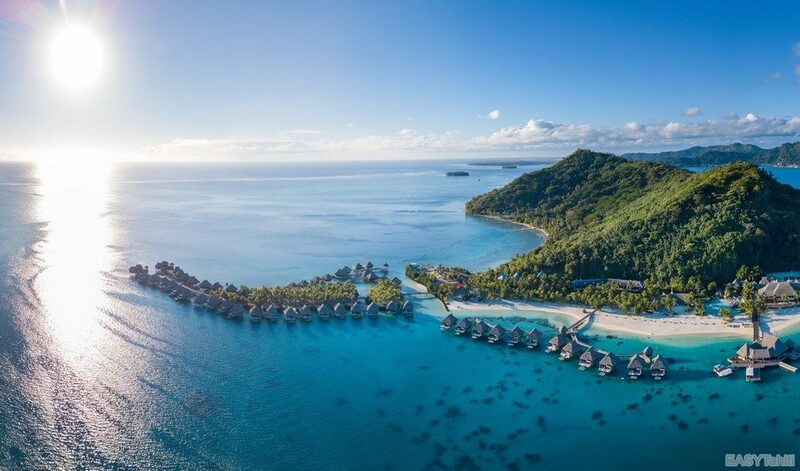 - Arrivals / Departures inter-island flights / cruises: Transfers between the airport (located on a Motu north of Bora Bora) and your accommodation will be organized by your travel consultant EASYTahiti according to your inter-island flight schedule. 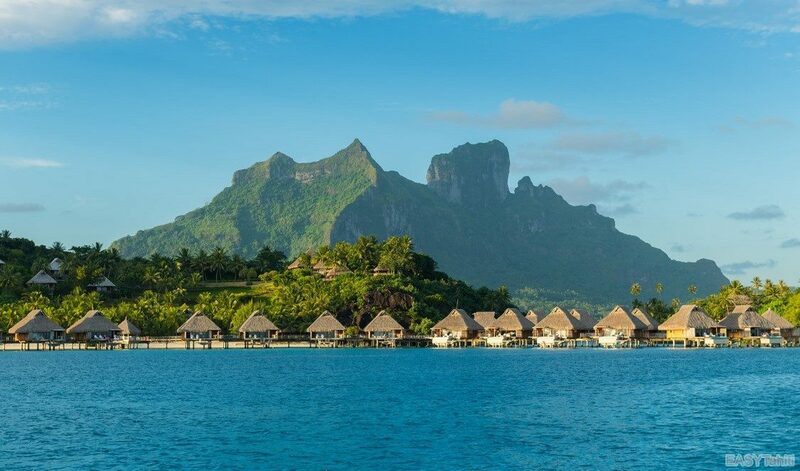 In the case of a transfer from another hotel in Bora Bora or a cruise arrival at the Vaitape wharf, please inquire with an EASYTahiti Travel Advisor. 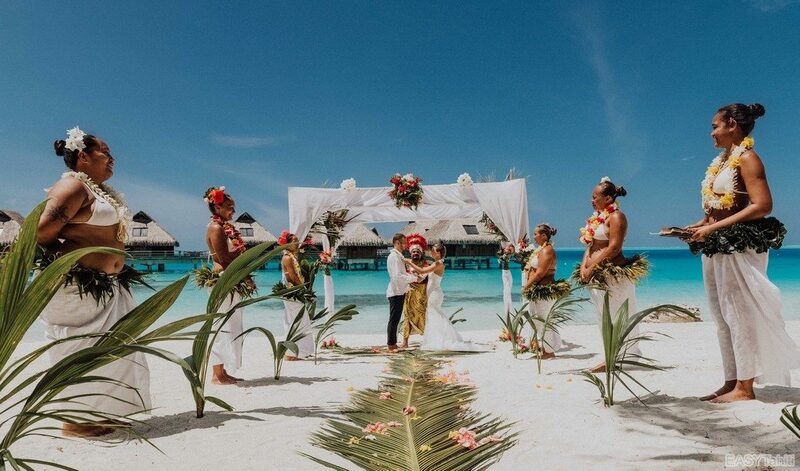 - For your personal travels: Paid shuttles between the accommodation and the main island are set up by the hotel several times a day at fixed times. 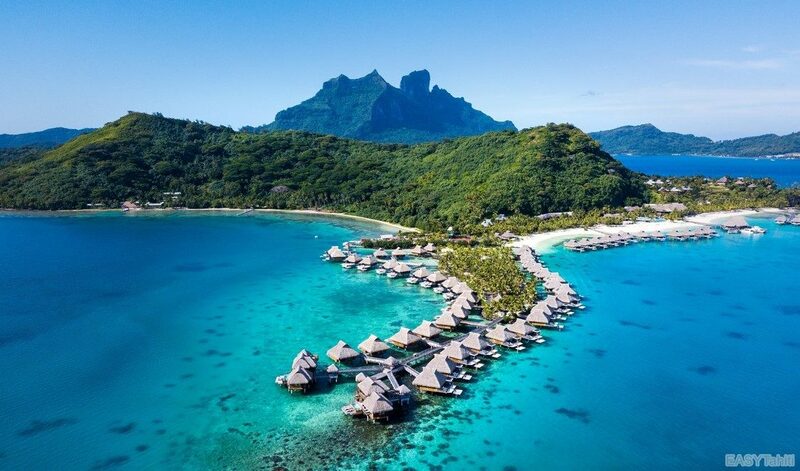 For more details, please contact an EASYTahiti travel advisor. 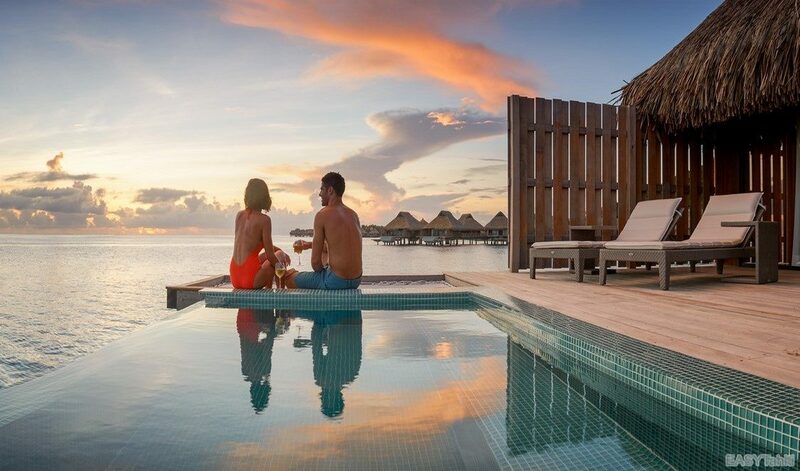 - For your activities and excursions: Return transfers from your accommodation are generally included in the price of excursions and made by the provider itself. In the case of a tour booking through us, the pickup time at your accommodation will be mentioned on your travel documents. 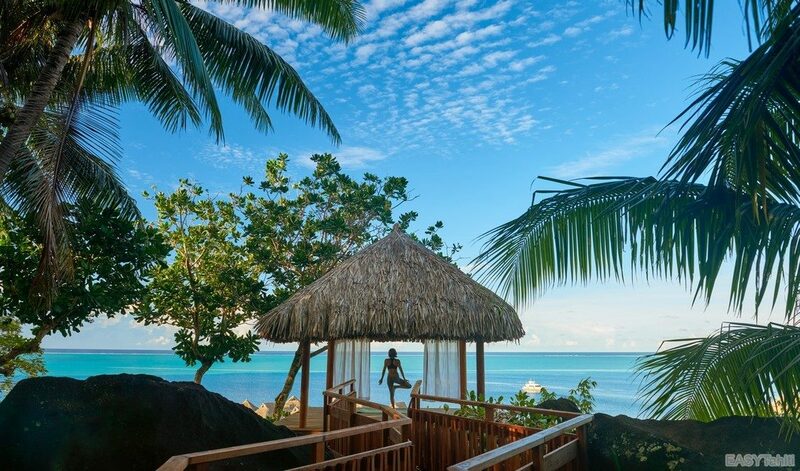 * Note: For the reservation of an activity without transfer, please contact your EASYTahiti travel advisor. 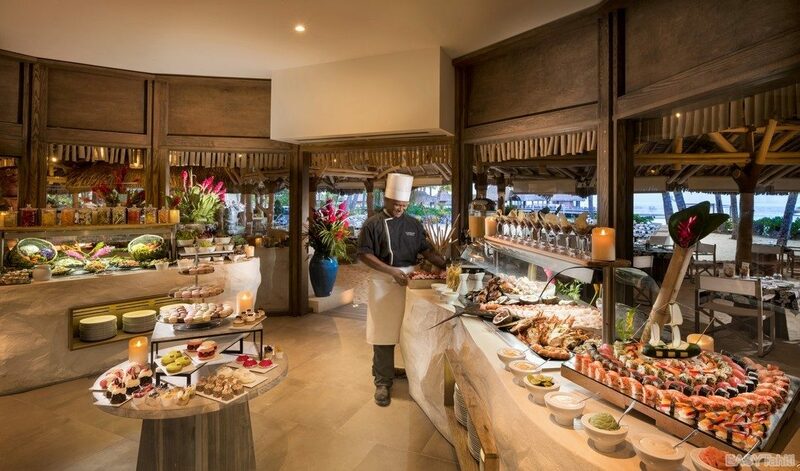 The restaurant "Iriatai" welcomes you from 7:00am to 10:30am for breakfast, and from 6:30pm to 9:30pm for dinner. 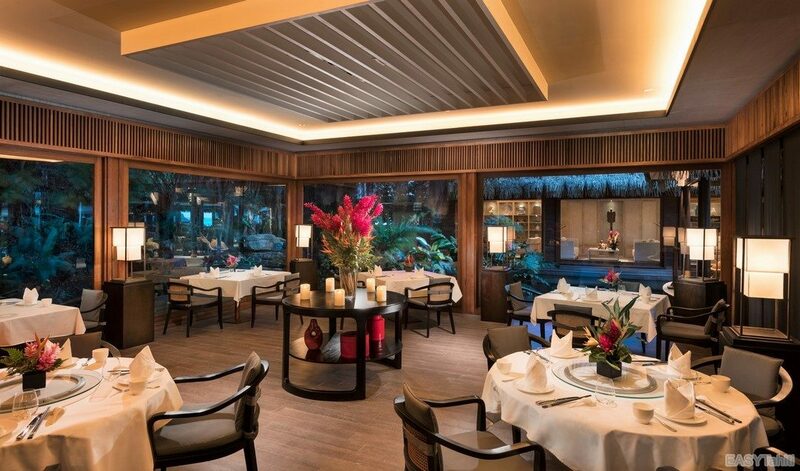 This is the restaurant "signature" of the hotel located on the 1st floor of the main building. 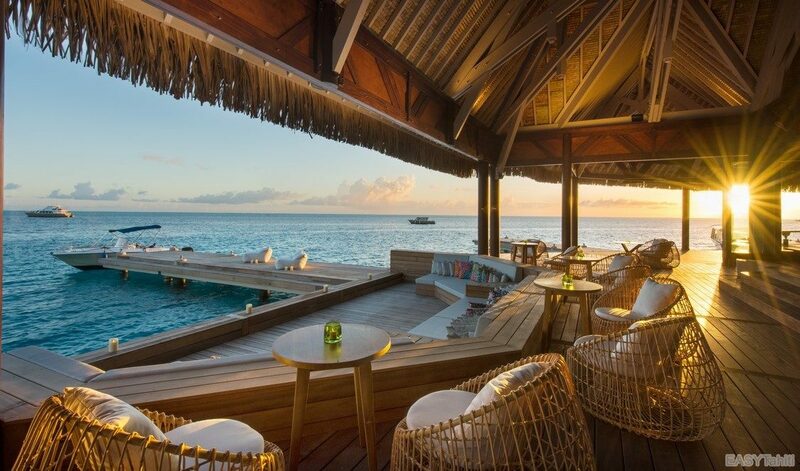 This restaurant, typically French, offers a beautiful view of the lagoon. Closed on Tuesday evening. 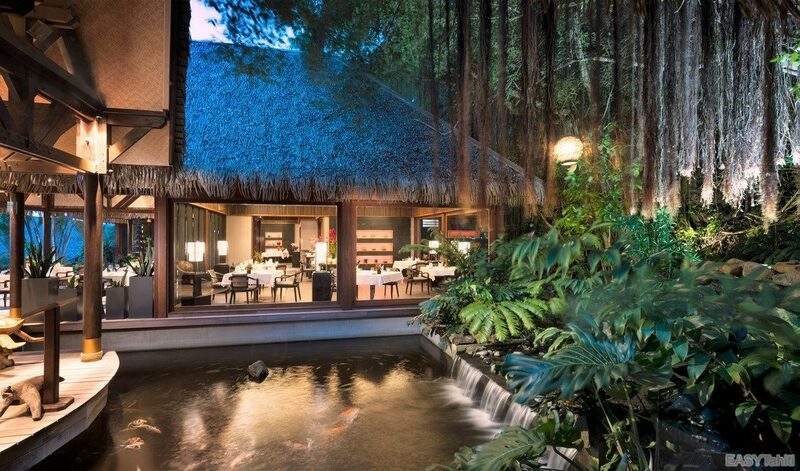 The "Banyan Chinese Restaurant" is a restaurant offering indoor and outdoor areas with tropical plants and a pool of water. 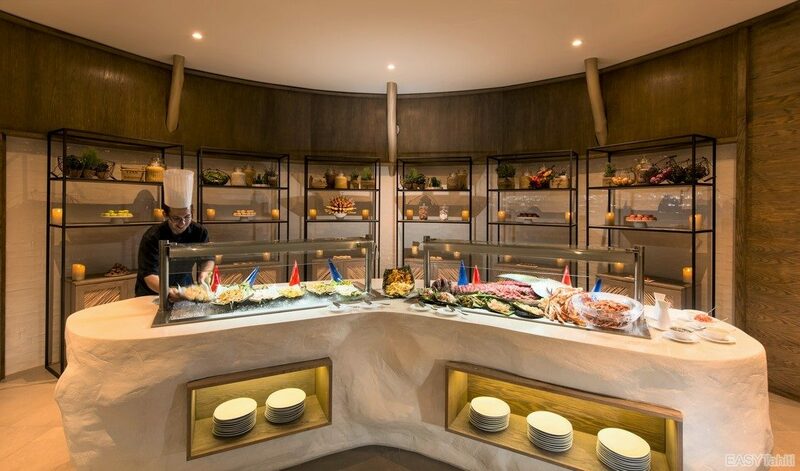 The chef is inspired by the culinary traditions of several regions: Guangzhou, Fujian, Ningbo and Hainan Island. Open only in the evening from 6:30pm to 9:30pm. Closed on Tuesdays and Fridays. 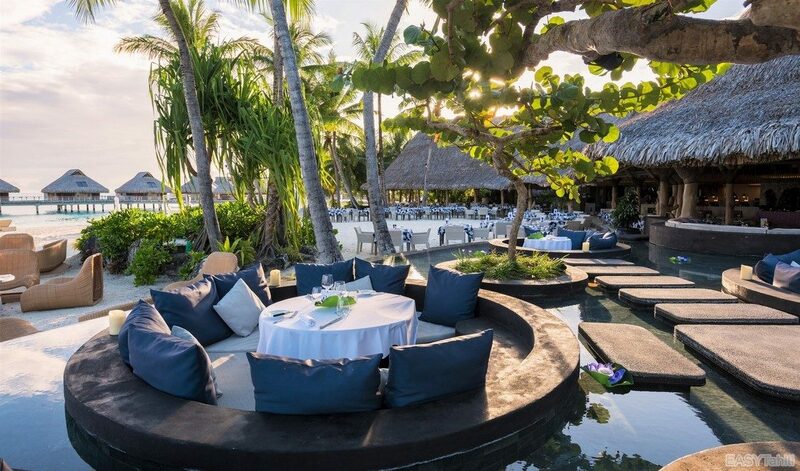 "Tamure Beach Grill" is a restaurant overlooking the lagoon, offering a relaxed dining concept with feet in the sand.The menu offers a selection of Mediterranean and Polynesian dishes, prepared in the open-air kitchen and traditional Tahitian oven. Themed dinners every Tuesday evening Open from 10:00am to 10:00pm. "The Upa Lounge Bar" combines sophisticated comfort and thrills when discovering the coral reefs of the lagoon with the glass floor of some parts of the bar, whether indoors or outdoors, this is the perfect spot for soak up the view while enjoying cocktails and fine wines, and enjoy live music on Wednesday and Sunday nights, open from 5:00pm to 11:00pm. 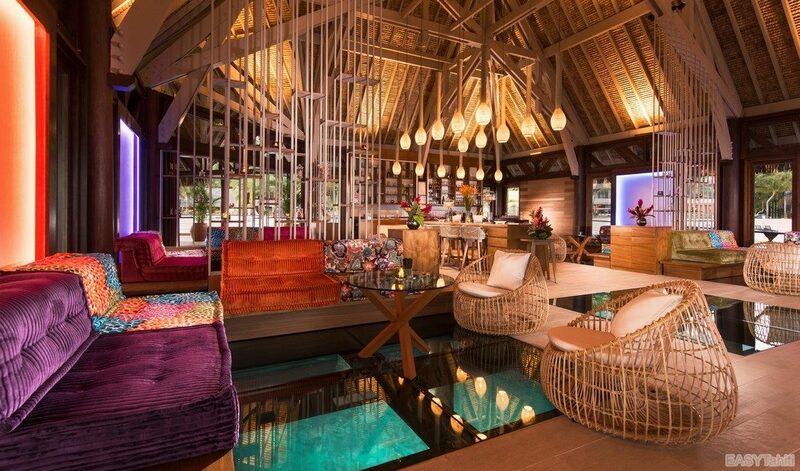 The "Pool Bar" is a bar immersed in the pool. A la carte: revisited cocktails, ice cream and non-alcoholic beverages. 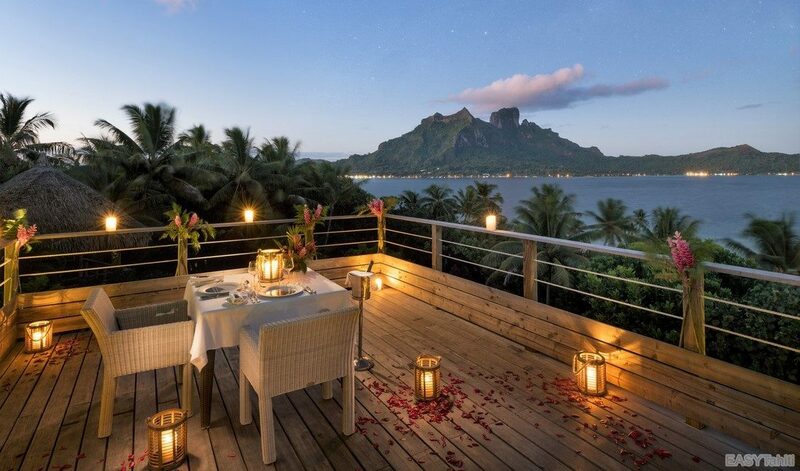 * Note: You can choose to pre-book your meals with your room or your bungalow with an EASYTahiti travel consultant, you will save 8% on VAT. 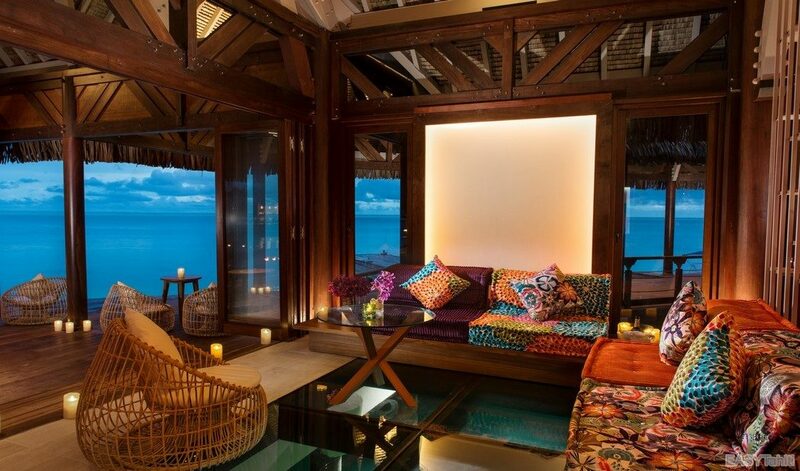 Breakfasts are already included with this accommodation, but you can choose to include lunches and/or dinners. - Breakfast included: This is an American breakfast buffet. 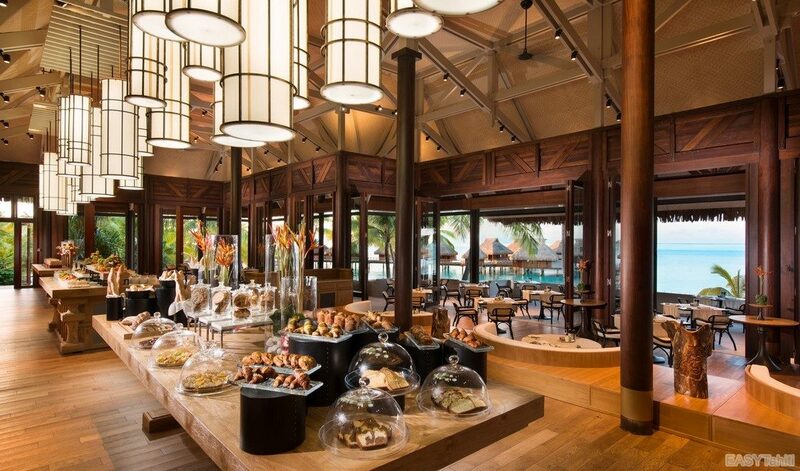 Hot drinks (coffee, tea, chocolate), fruit juices, yogurts, cereals, bread, special breads, pastries, butter, jams, honey, cold cuts, cheeses, and Polynesian specialties are on the menu. He gets himself at the main restaurant "Iriatai". It is served from 6:00am to 10:30am. 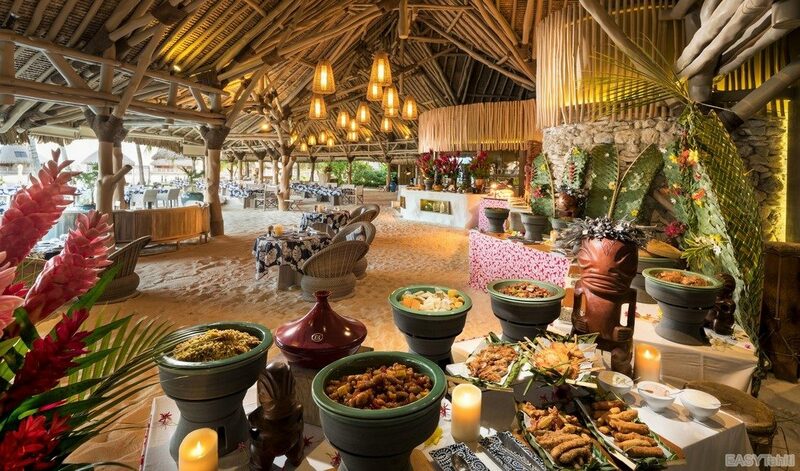 - Lunch: Lunch is a "3-course" menu (starter-main-dessert), à la carte of the restaurant "Tamure Beach Grill". Drinks are extra. 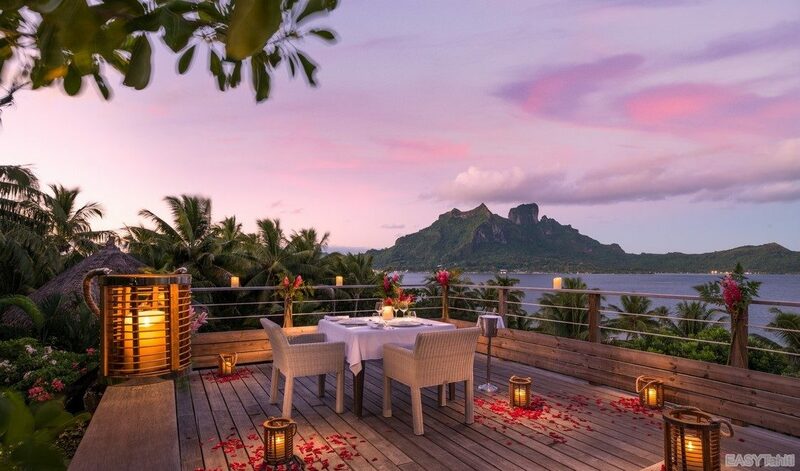 - Dinner: Dinner is a "3-course" menu (starter-main-dessert), à la carte of the restaurant of your choice subject to availability. A supplement may be applied on some dishes (shown on the card). Drinks are extra. Special dinners (Christmas Eve and New Year's Eve) require an extra charge if you have opted for half board or full board. 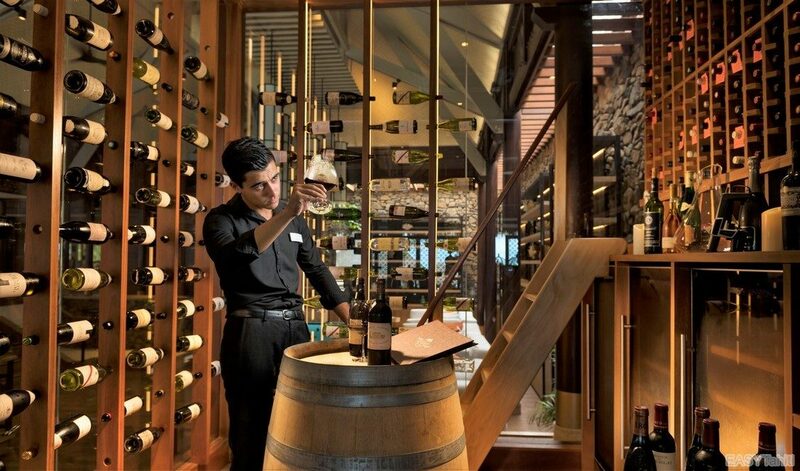 Artisanal and cultural demonstrations every day. 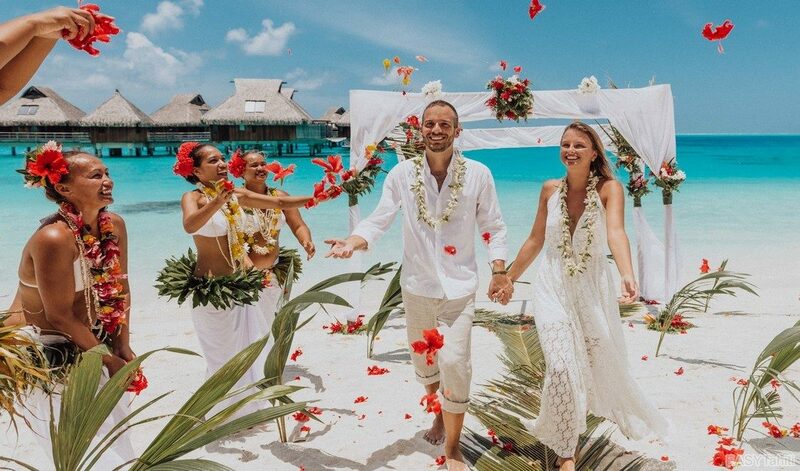 The hotel has a concierge service from which you can inquire to participate in paid activities with external service providers, offered by the hotel. 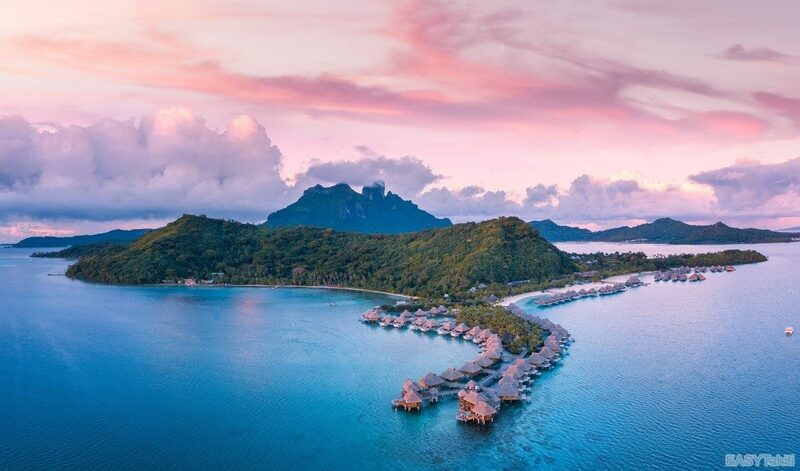 * Note: To ensure a competitive rate and minimize downtime, you can get in touch with your EASYTahiti Travel Consultant to organize your activity plan in advance. 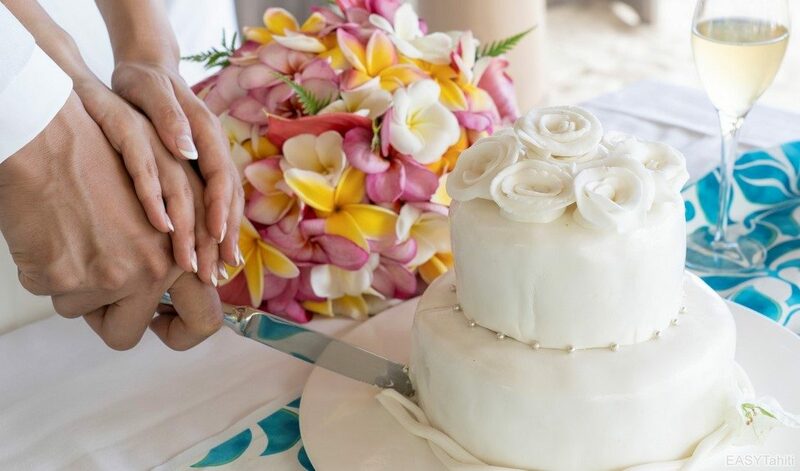 We invite you to consult our catalog of activities by clicking HERE. 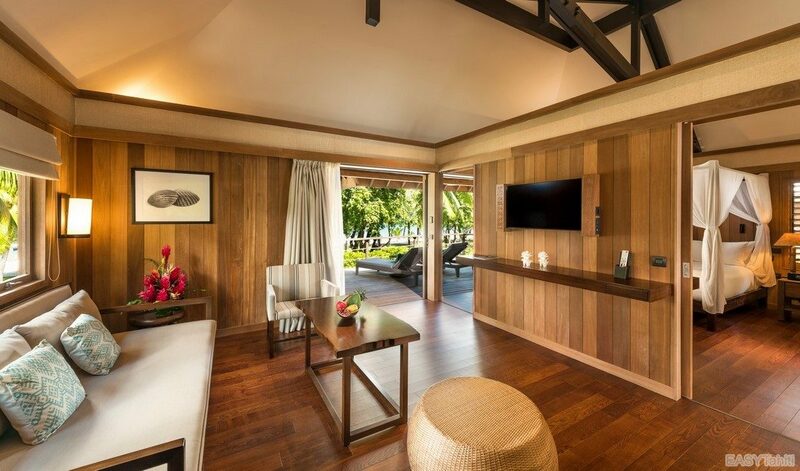 With 1000sq.ft, the Lagoon View suites is convenient for families. 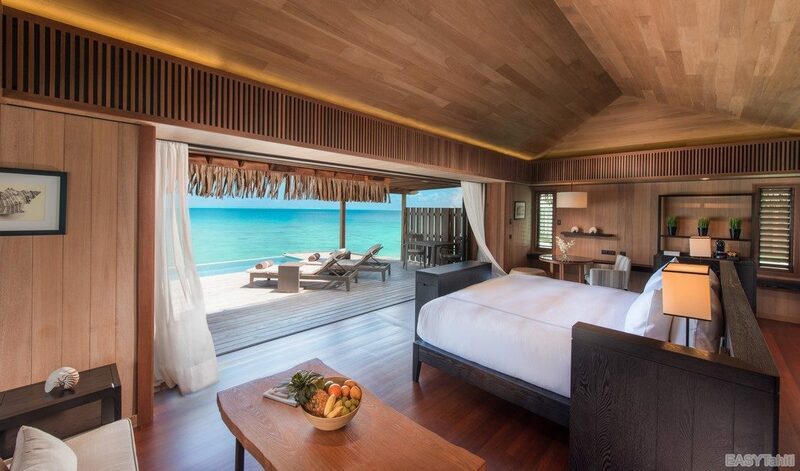 All villas & Royal Suites feature a very spacious bedroom and living-room separated by Japanese panels. Max 4 persons. 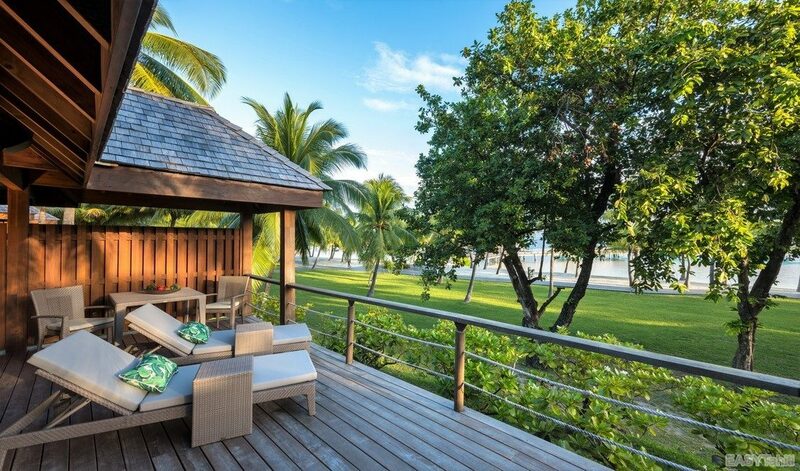 With 900sq.ft, our Beach Villas are an exceptional garden and beach style accommodation. Max 4 pers. 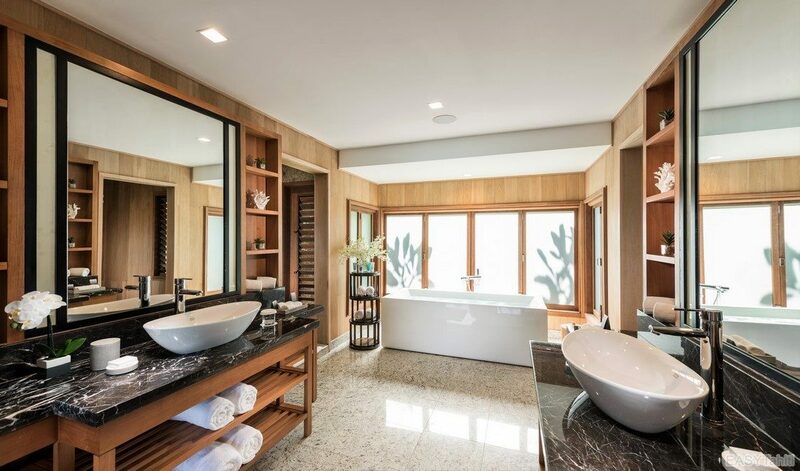 The Royal Hillside Spa Suites features a unique panoramic location (1350sq.ft). 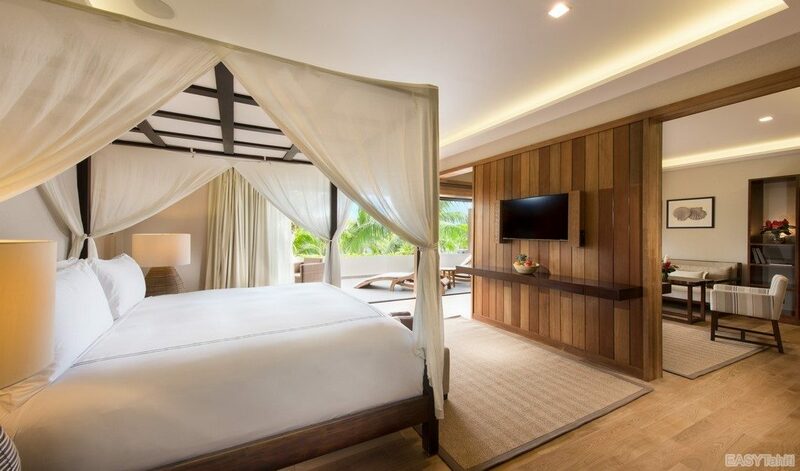 All villas & Royal Suites feature a very spacious bedroom and living-room separated by Japanese panels. Max: 4 pers. 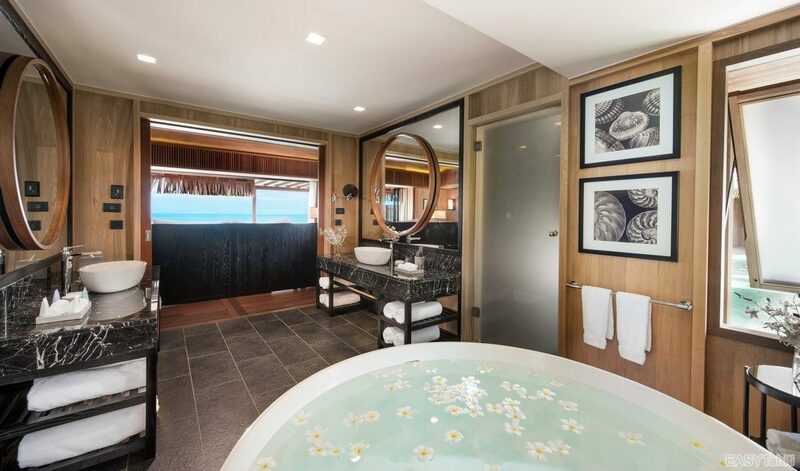 With 950sq.ft, the Overwater Villa provides an indigenous views of the Motu and on the lagoon with its glass floor viewing panels. Max: 4 pers. 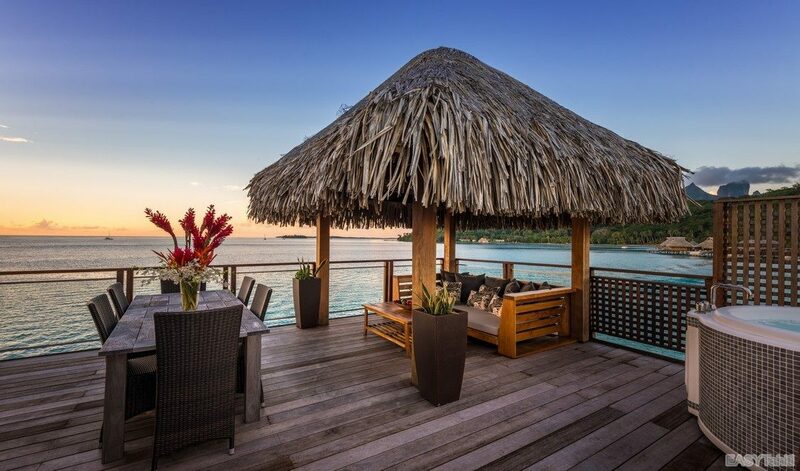 With a breathtaking panoramic view, you will experience the authentic Bora Bora Nui and the beauty of the lagoon with the deck glass floor panels. Max: 4 pers. 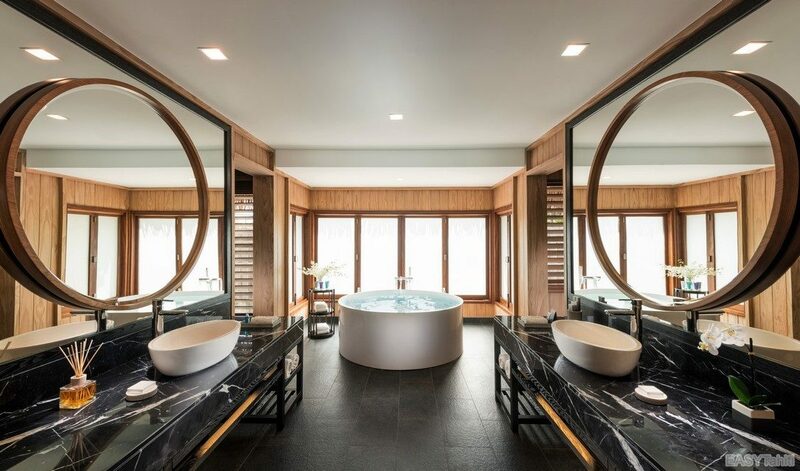 The Royal Hillside Spa Suites features a unique panoramic location (1350sq.ft). Max: 4 pers. 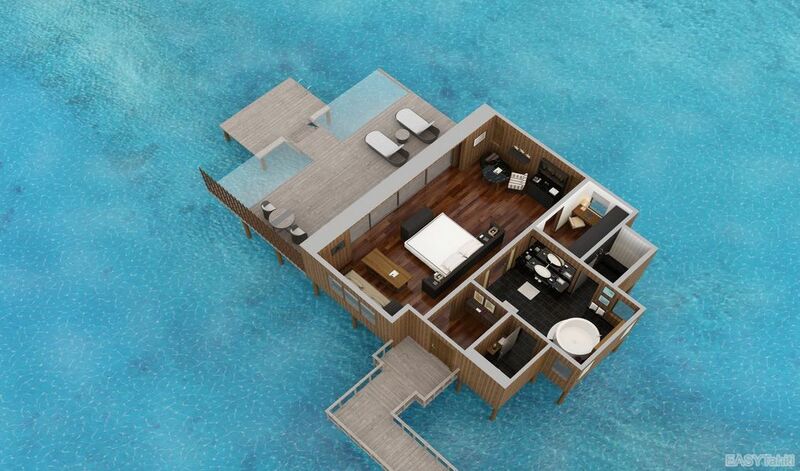 1350sq.ft of pure indulgence over pristine waters for a unique experience. Max: 4 pers.